EISI was one of nine exhibitors at the Philippine Librarians Association, Inc.-Southern Tagalog Region Librarians Council (PLAI-STRLC) two-day seminar workshop on “Research in Librarianship: Challenges, Competencies and Strategies” last October 9-10, 2007 at La Vista Pansol Resort, Pansol, Calamba City, Laguna. 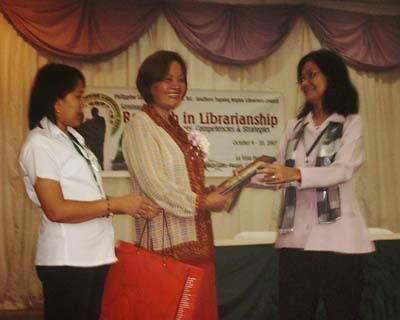 The Southern Tagalog Region Librarians Council of PLAI covers the provinces of Laguna, Cavite, Batangas, Quezon, Aurora, Rizal, Palawan, Marinduque, Romblon and Mindoro. Participants were composed of librarians and information professionals in Region IV. Aim of the said workshop were (1) To provide the participants an opportunity to gain greater and deeper knowledge on the principles, methods, techniques and other major issues involved in research; (2)To enhance librarians’ competencies and skills in research; and (3) To broaden perspectives and encourage proactive involvement in conducting research. Aside from being an exhibitor, EISI provided much needed equipment support to this library event. Pictures below.